Nico Muhly's Two Boys uses video projections, a constantly shifting set of six large three dimensional panels (onto which much of the video is projected, and in which much of the chorus is arranged), a typographically unique approach to surtitles, and a large cast of principal and supporting singers, to tell a thoroughly modern story of identity deception as mediated through internet fora and fauna. This opera is refreshing in so many ways. Its taking of contemporary subject matter is not in itself unique, though its story happens to be particularly compelling and indeed particularly congenial to operatic framing. It is rather the way in which Muhly and his creative team render the manner of the telling continuous with the nature of the subject matter that is so refreshing here; the sets, full of depth, feel vibrant with digital life. It is rare that surfaces are not functioning either as screens for projection or projecting screens; private message board chats flash up in neat and messy formations; CCTV footage fractures across space and pixelly webcam footage hikes up poignancy and fragility; and the surtitles are in varying script that often reads, in its sense of frenzied superscriptural collage, more like concrete poetry than conventional, humdrum, bold-type surtext. The libretto itself, meanwhile, is full of the sort of shortcuts and neologisms ('n2m', 'u', 'omg', and so on) that will be familiar to anyone who has spent time on comment threads or message boards. I began by giving authorial priority to Muhly, but in point of fact this opera, so multiform as it is, would be better described (even more so than is usually the case) in terms of a collaboration between the principals. 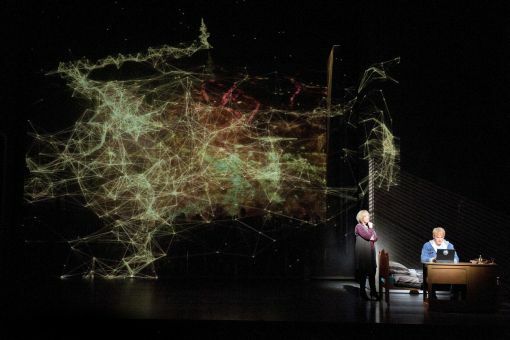 These are; Muhly, librettist Craig Lucas (who generally captures the operatically alien idiom well, lending a sense of heightened naturalism to the proceedings), conductor Rumon Gamba, director Bartlett Sher, and video designers Fifty Nine Productions. All of these principals do excellent work in giving the complicated staging its strong sense of cohesion and purpose. 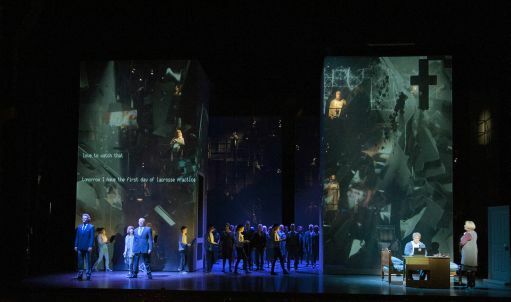 The subject matter of the opera concerns the shifting character of social relations in a digital world, and pivots on the sense that morality itself is scrambling amidst the scramble of digital mediation. Sixteen year old Brian is being questioned by Detective Anne Strawson about a serious assault in which he is the main suspect. The opera is comprised of a temporally split narrative where the scenes in the police station are counterpointed with Racconto enactions of Brian's internet communications with thirteen year old Jake, and a host of other characters who are not at all what they seem. This subject matter is mapped acutely in the opera, as I have noted, onto and into a grid of distributed media that split across fragile and shifting surfaces, and fragile and shifting character-identities. The skill and sometime magnificence of the video projections deserves special mention: Like Ryoji Ikeda's datamatics (to which they surely owe a degree of debt), they seek to picture, to delineate, what Ikeda calls the 'invisible multi-substance of data that permeates our world'. This is a form of data that drives this opera, both in terms of its subject and its form. Whilst the video projections do not manage this delineation quite as inventively as Ikeda's visuals do, they nevertheless vivify the action again and again here, giving the opera a sense of conceptual integration and visual opulence that occasionally lifts it to great, great heights. The richness of the show, incidentally, lies as much in the crucial technological framework of the action as it does the more traditional elements of deception, dynamic, and intrigue (which elements are nonetheless managed here with skill and subtlety): this opera makes us witness to a mutation in the technology of the flesh as gripping and as strange as those in early-Cronenberg. As with something like Videodrome, Two Boys understands that the distinction between the virtual world and the 'real' world is an illusory crutch, and that transformations in technological media signify transformations in human ontology as such. Identity has never been stable nor wholly material; these new digital technologies simply make more explicit the bundle of extensions, avatars, and fictions that go into making up our engagement with the world as an apparently unified subject. The opera also understands that the great tragic point about the media on which it is based is that they rely upon the pull of the Lacanian death drive, as opposed to any desiring relationship, and as such individuals like Brian, and, in some of the opera’s best sequences, a chorused jumble of anonymous subject-fragments spewing gibberish and emotion, are pulled back into perennial and morally problematical cycles of repetition. Those media also produce the corollary feelings of anonymity that make the pivot on which this opera turns. With so much going on in terms of the technical and conceptual aspects in this piece, the music takes something of a back seat in terms of anchoring the drama and driving the narrative. However, that music is persuasive, discreet, and tasteful (and I don't mean that last pejoratively). 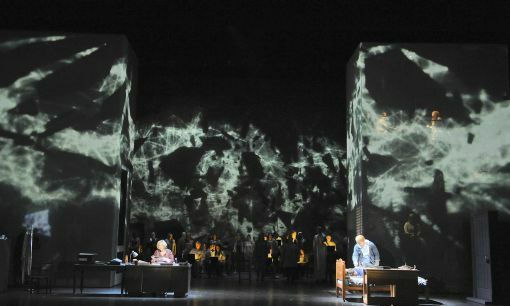 Throughout, Two Boys recalls Nixon's surging arpeggios; Glass' ostinati; the wispy tone colours of Gamelan; Jonathan Dove's seductive gestures and patterns (with whose Siren Song the opera shares a thematic link); and Britten's subtle touch with orchestration (the distinctive beginning of Turn of the Screw is referenced in the introduction to the climactic scene), with all of these qualities albeit spiced up by Muhly's preference for the piquant chromatic amidst a spooling diatonic line, a tonal touch that often leads his material into unexpected places. Muhly uses a rising four-note motif as a central point of reference, deriving much material from that initial gesture and thus giving the whole a well-worked and convincing sense of integrity. There is also often a beauty about the score that underlines the poignancy of the story very effectively. Conductor Gamba is good on the structural side of things, whilst also massaging a sense of emotional identification without being too forward in the mouth regarding the opera’s desolateness of heart. Muhly has created a sensuous and rather wonderful score, then, whose broad, measured and purposeful restraint often bursts out into moments of stunning vividness, as in the layered and moving chorus that closes the piece, or in the first great climax of the opera, which comes amidst a wild jumble of characters, text, and video, about half an hour in. That peak feels especially well-earned after something of a hollow opening, incidentally, where Detective Strawson sets the scene in a disenchanted, fatigued way. So whilst the opera takes a while to get going, that sense of pacing is in the end crucial to its impact. Structurally, apart from a lag in the latter part of the first act (which may profit from being turned into an additional short second act), little is off-target here. Susan Bickley in the role of Detective Strawson didn't quite have the vocal heft or vibrancy that was needed for that opening, and one felt she was perhaps making too much of the world-weariness of her character there and elsewhere. However, as time wore on and Strawson become less hateful, reactionary (one of the major weak points is Strawson's rather silly shift from incredulity to credulity), and crassly antagonistic to the actors of the case, she gained more of my sympathy. Nicky Spence displayed much more vocal assurance in the central role of Brian, if anything singing with a level of charisma that one felt was perhaps beyond his character's apparent young years. Spence conveyed poise and a depth of vocal presence through secure and powerful projection, and he commanded the melodic line without sacrificing a certain agility of touch. If I would raise any objection it would be to say that, as with his characterisation more generally, Spence's vocal performance lacked something of the sense of differentiation that would have helped the shifts between Brian-in-the-police-station, and Brian-in-the-past, to convey a gradated dramatic structure. However, broadly-speaking, Spence's leathery assurance gives Two Boys an authoritative central vocal presence. Mary Bevan, in the difficult and somewhat elusive role of Rebecca, matched Spence in assurance and vocal confidence, whilst also conveying a richness of tone colour, and a sense of fragility and shade, that was just a little lacking in his performance. Jonathan McGovern's (older) Jake is likewise strong. Heather Shipp was just about threatening enough as Fiona, although Robert Gleadow in the smallish but significant role of Peter rather over-eggs the pudding, coming off a little like a cheap Peter Quint. Joseph Beesley's Jake is an interesting creation; often beautiful vocally, though a little shaky here and there in terms of intonation, Beesley has the difficult task of conveying an intelligence and a sort of enigmatic sensibility for his character that might go some way to making credible his motivations, not to say his ability, for doing what he does. I don't think he quite manages to do that, but his performance is worthy of note, nonetheless, and certainly not without pathos. A fascinating production, then, which boldly ventures out into the world where other operas cling to the coattails of tradition. Though not without its problems, Two Boys in the end proved itself to be dramatically resonant, musically strong, and conceptually and technically stunning.